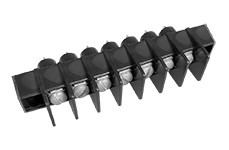 Magnum-Cooper board mount single screw terminal. Uses a # 6 screw. 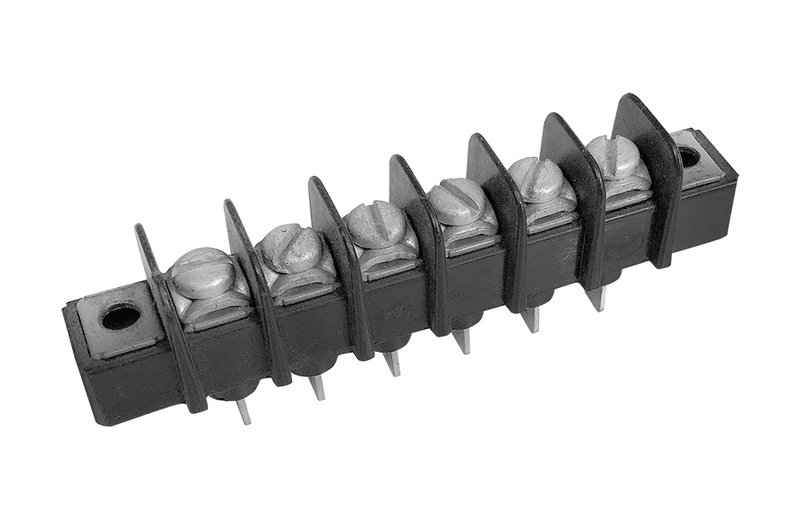 Zierick Manufacturing PCB right angle screw terminal, single row. 9P PCB mounting. 0.375". 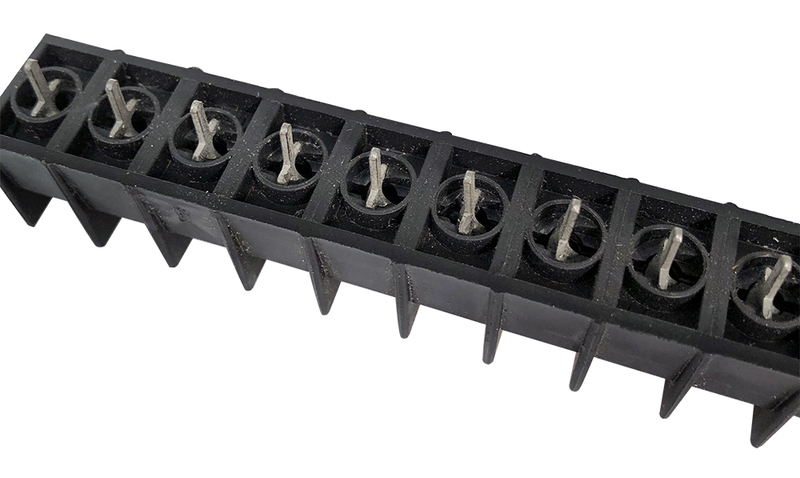 Blockmaster 2 pole, covered barrier terminal strip. 20 amp @ 300v. 12 AWG wire. Solder lug. 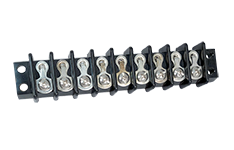 5/8" x 1-5/8" x 3/4"H.
Kulka feedthru barrier terminal strip. 2 position. Series 603. 50 amp, 600v, 12 - 10 AWG. 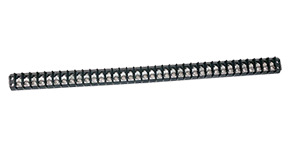 Cooper Bussman "Magnum - A2" single row barrier terminal strip. Shrouded, extra long 1/2" terminals. 2 position, 20 amp, 300v. 13/16"L x 5/8"W x 3/4"H + shroud and terminals. 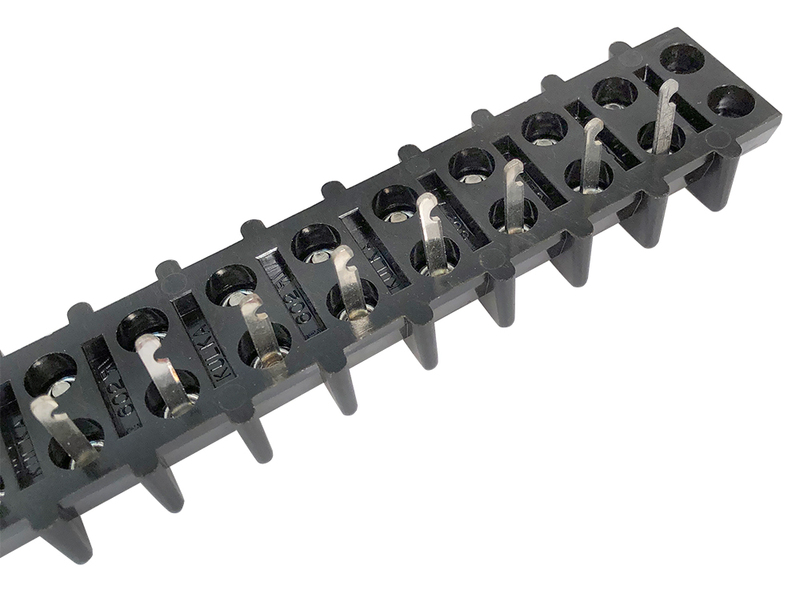 Kulka 2 position, single row feedthru barrier terminal strip. 30 amp. 1-5/8"L x 1-1/8"W x 1/2". 3 position barrier feedthru terminal strip. Navy, gray. 2" x 5/8" x 1/2"H. 1-3/4" c-c mounting holes. 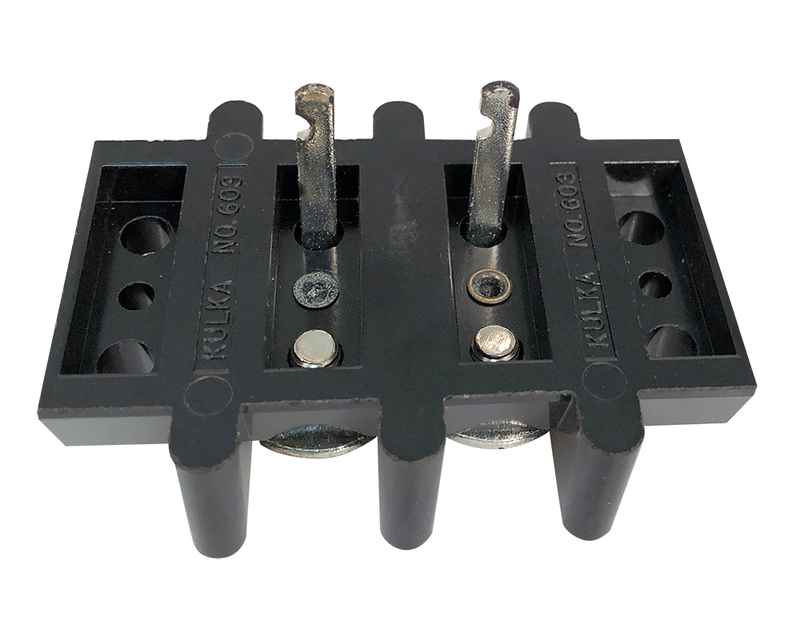 Kulka 3 position, feedthru, 40 amp, 1-3/4" x 3-3/16"L.
3 position, terminal "ID" placcard. 7/16" hole spacing. 1-5/16" x 2-1/16". Mfg. 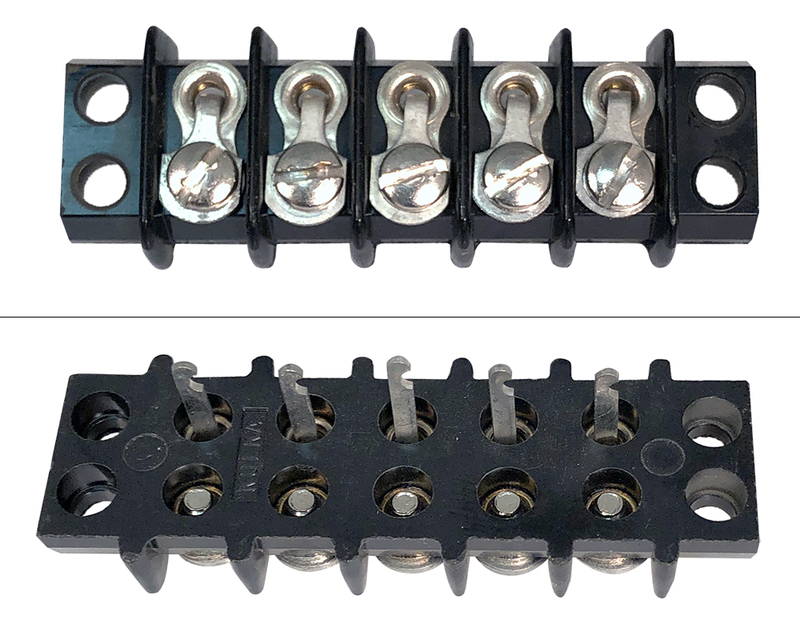 P/N: 367-1845-020.
Cooper Bussman terminal strip combo - barrier terminal strip and cover strip. 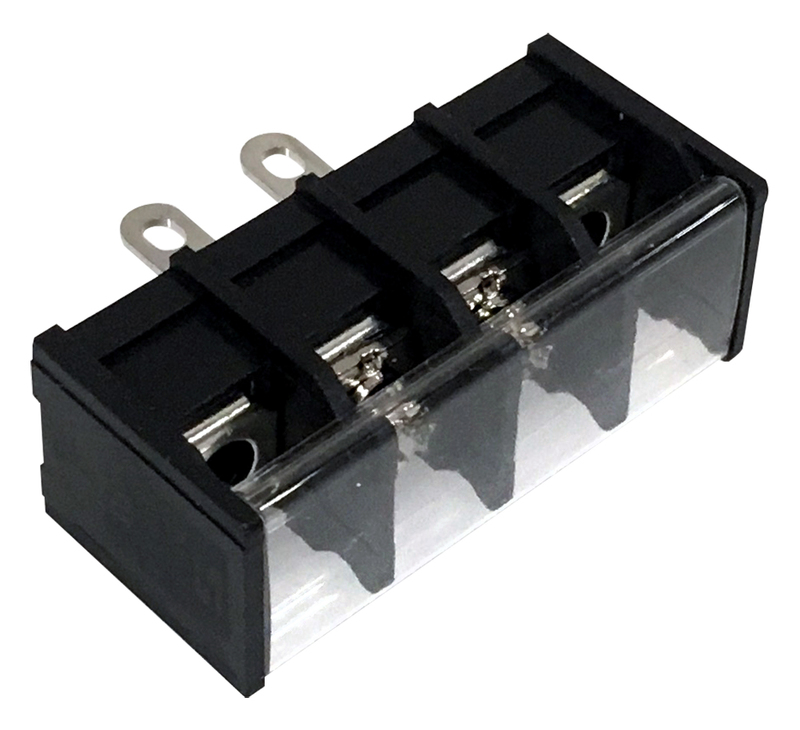 3 position, 20 amp, 300v, shrouded, wire tie terminal. 1-15/16"L (1-1/2" center mounting holes). Terminal strip P/N: A20130307CA. Top cover P/N: C02-03-00. 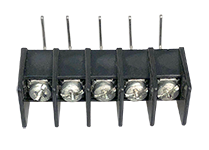 Kulka/Cinch 4 position double row barrier feedthru, 20 amp, 2-3/16"L x 7/8"W x 3/8"H.
Eby single row barrier terminal strip. 4 position + center mount / ground. 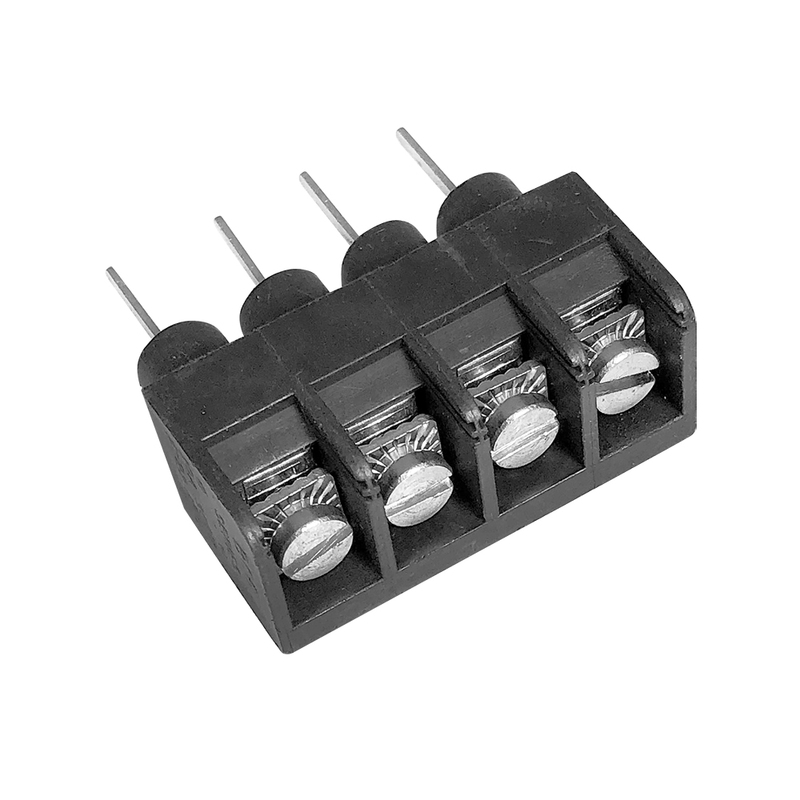 0.375" pitch, 20 amp, 300v. 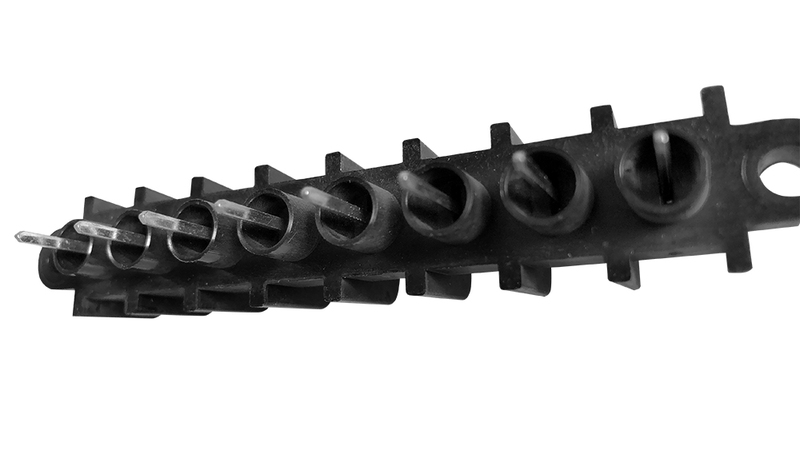 1-15/16"L x 9/16"W x 5/8"H. Straight pins out bottom for PC mounting. 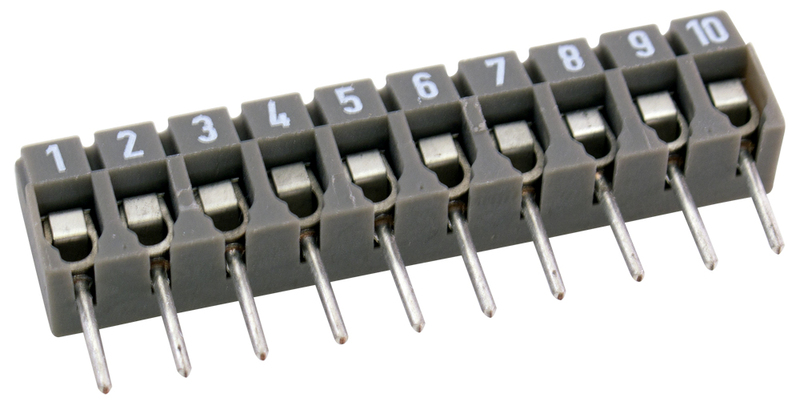 Wieland PCB terminal block. 4 position. Vertical PC mount F/T. 300v, 10 amp, 0.20" pitch. 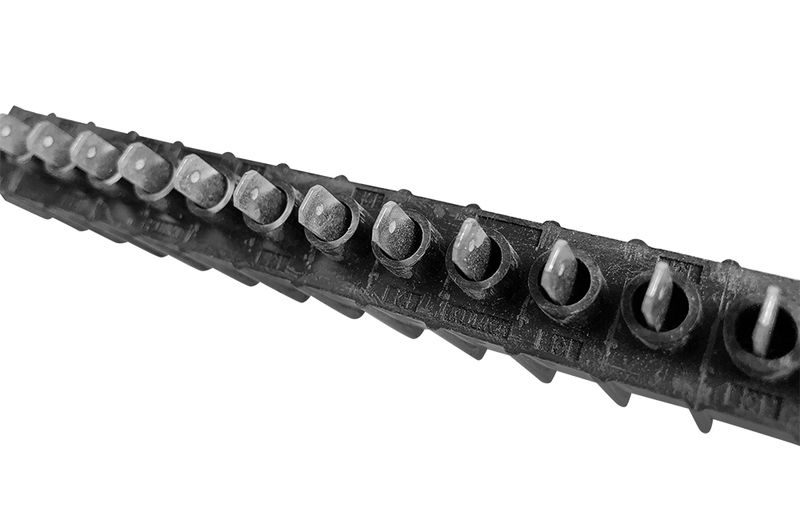 Screw/spring connection. 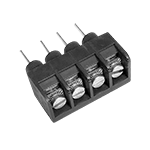 0.793" x 0.329" x 0.462"H.
Cinch 4 position, feedthru, 40 amp, 1-3/4" x 3-7/8"L.
RDI PC mount terminal block. 4 position. 20 amp. BC6 Series. 12 - 22 AWG. 1.555"L x 0.614"W. 0.310" outer diameter shroud. 0.375" terminal centers. 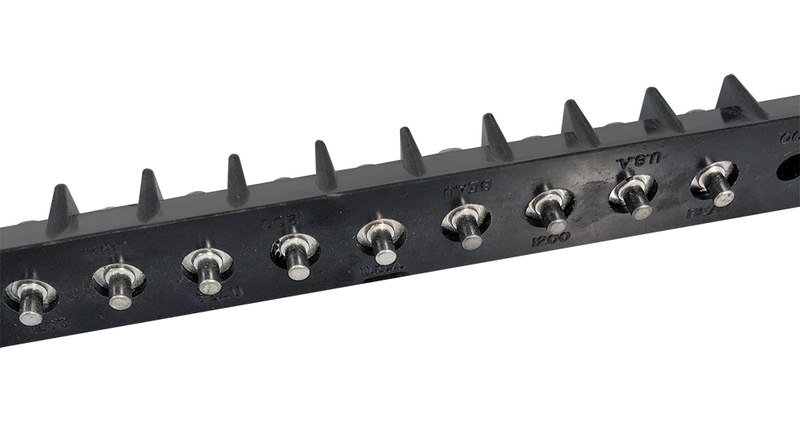 Kulka 4 position single row barrier terminal strip. Accepts 1/4" spade lugs. Terminal #1 has an extra male lug attached. 2-3/16" mounting centers. 2-1/2" x 1-3/16" x 5/8". Magnum right angle PC mount terminal block. 5 position. 15 amp. 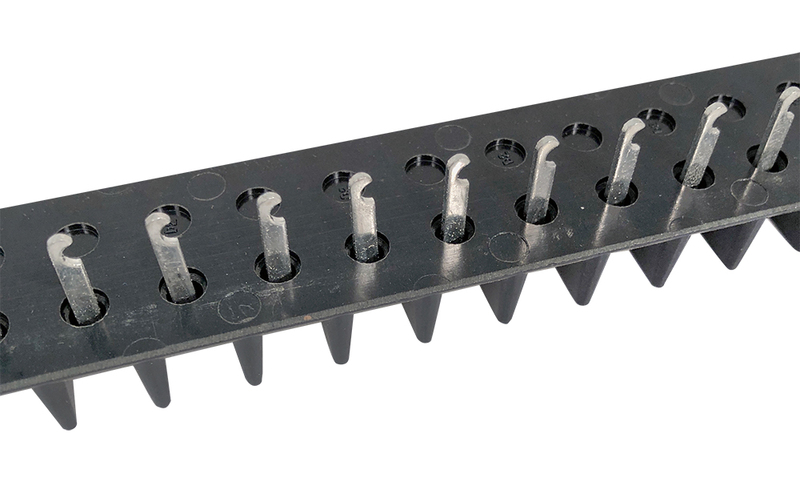 1.94"L x 0.65"W x 0.752"H.
Kulka 5 position dual row barrier feedthru terminal. 20 amp. 2-17/32" x 7/8" x 13/32". Beau barrier terminal strip. 7200 Series. 6 position. 20 amp. 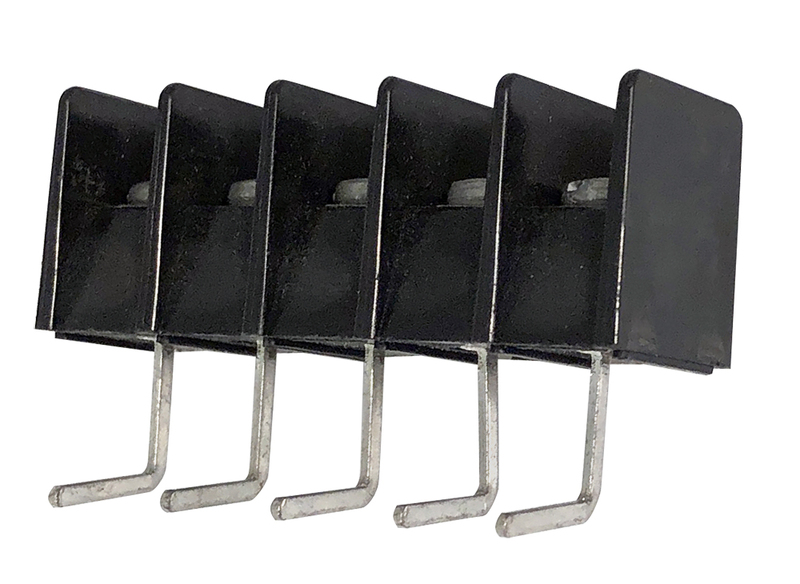 3"L. 3/16" QD spade terminals. 2-5/8" mounting centers. 6 position terminal block. Single screw feed thru. 4 unthreaded hole mounts. 600v, 10 amp. 3.39"L x 1.125"W x 1.188"H. NSN: 5940-00-983-6127. Kulka barrier feedthru terminal strip. 6 position / poles. 50 amp, 600v. 5-1/4" x 1-3/4". 4.81" mounting center. 11/16" centers. Magnum barrier terminal strip. 7 position. 20 amp. 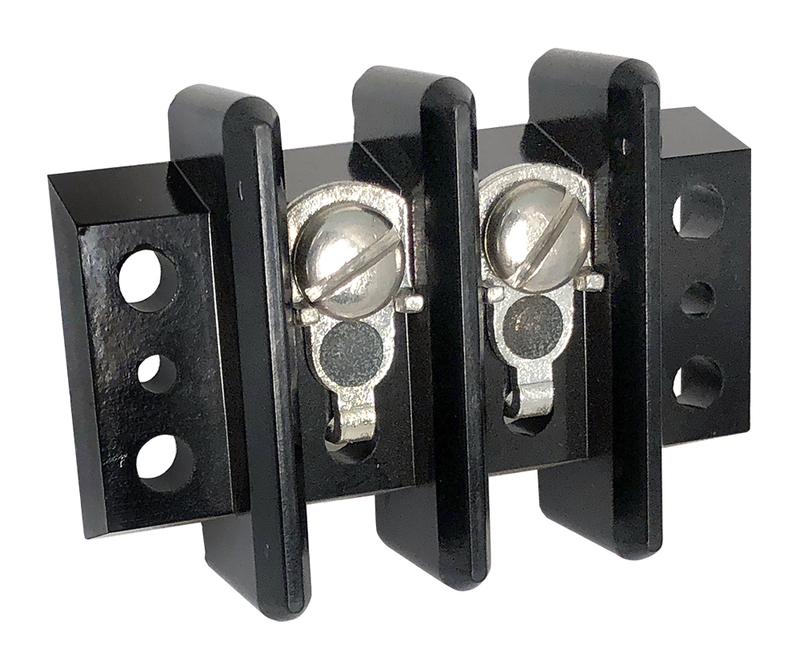 3-3/8"L. 3" mounting centers. Shrouded 3/16" QC spades. 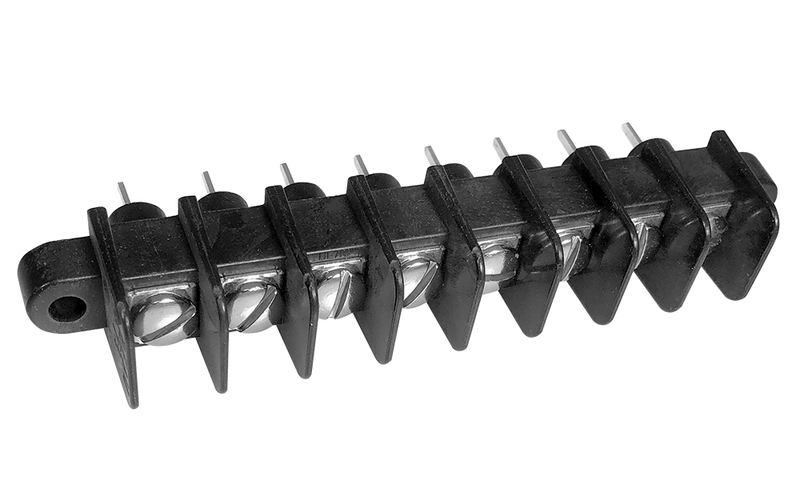 Molex Beau Series 73 single row barrier terminal strip. 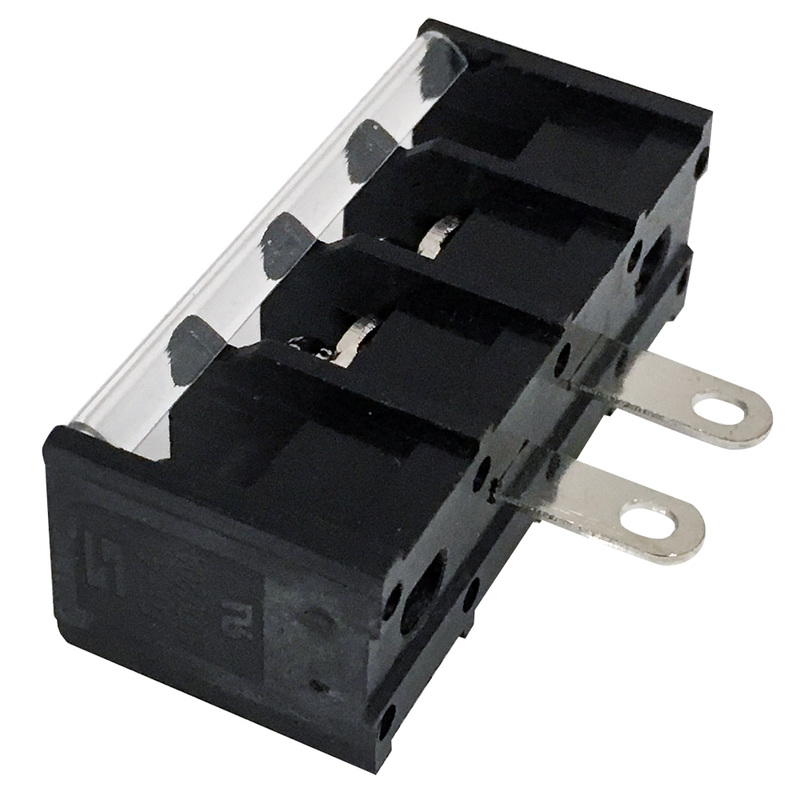 7 position, 30 amp, 300v, PC mount. 8-32 screws. 3-5/32"L x 3/4"W x 3/4"H. Straight pins out bottom for PC mounting. 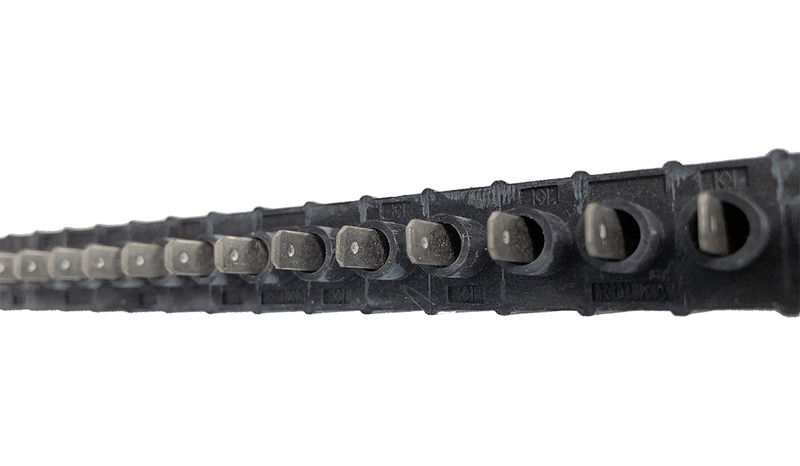 Magnum barrier terminal strip. 7 position. 20 amp. 3-7/8"L. 3/16" QC spades. 3-1/2" mounting centers. 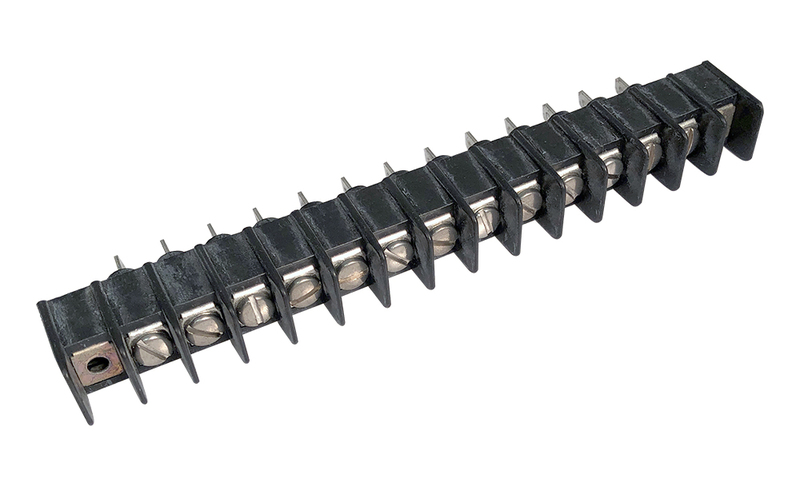 Cooper Bussman "Magnum - A2" single row barrier terminal strip. 8 position, 20 amp, 300v, PC mount. 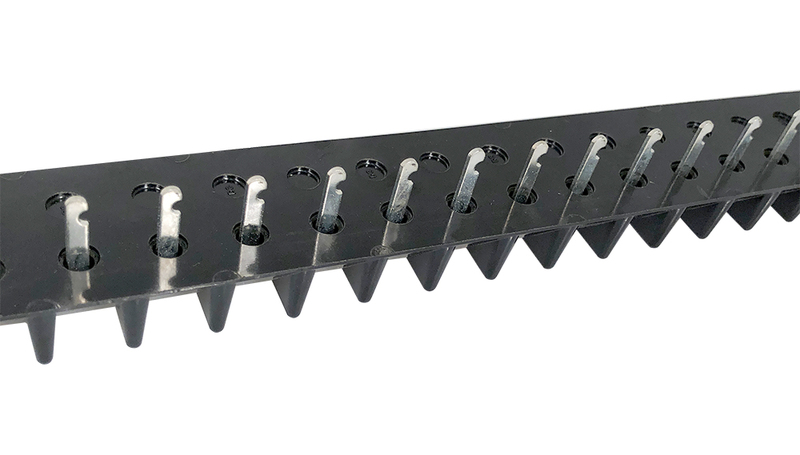 3-1/16"L x 3/4"H x 5/8"W.
Cooper Bussman "Magnum - A2" single row barrier terminal strip same as above except 10 position. 3-13/16"L.
20 terminal. 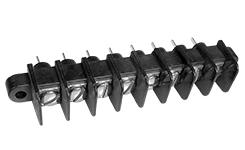 Single row barrier terminal strip is flush for PC mounting. Pins feedthru for board connection. Ear mounting holes. 9-1/2"L x 3/4" high. 8 terminal, 3-3/4" long. Otherwise, same as above. Harris P/N: 614-0738-000. Barrier terminal strip. PC mount. Shrouded terminals. 8 position. 30 amp. 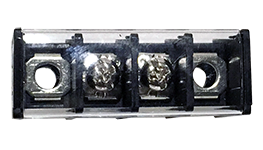 4-1/4"L x 3/4"H x 3/4"W. 3-7/8" mounting centers. 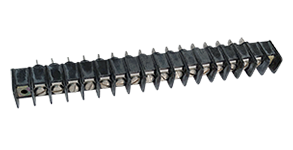 General Electric single row feedthru terminal strip. 8 position. Both sides labeled. 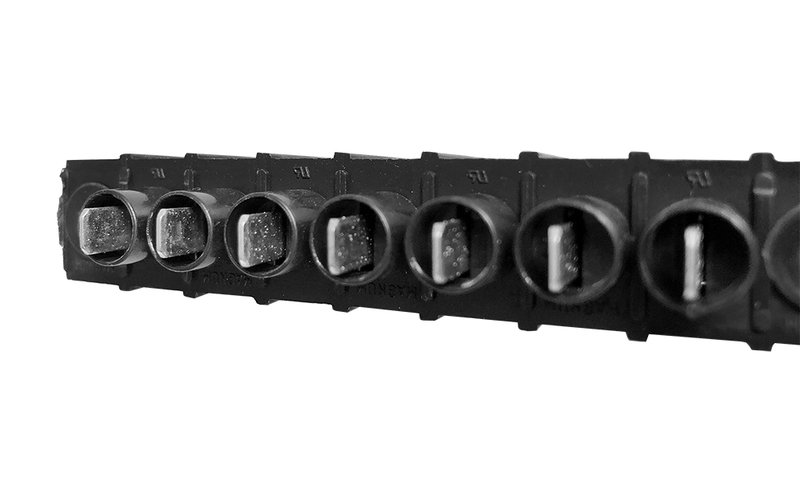 3-5/8"L x 7/8"W.
Magnum "A2" feedthru barrier terminal strip. Extra high barrier. 8 position. 20 amp. 3-3/8" c-c mounting holes. 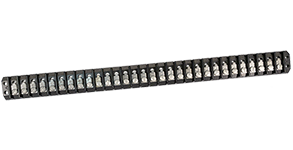 3-3/4"L x 0.675"W x 0.763"H.
Eby single row barrier PC / feedthru terminal strip. 9 position. 15 amp. No ears. 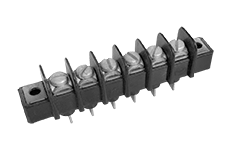 3.44"L x 0.571" x 0.641"H. 0.375" c-c.
Kulka single row barrier feedthru terminal strip. 9 position. 30 amp, 600v. 602 Series. 1-1/4"W x 6"L. 5-5/8" mounting centers. 9/16" terminal spacing. 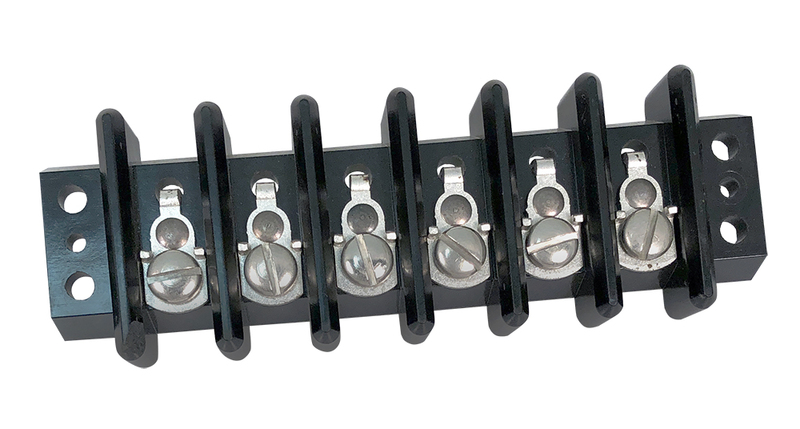 Magnum single row terminal block. 10 position. 30 amp. High barrier. 3.821"L x 0.641"W. 0.375" terminal centers. 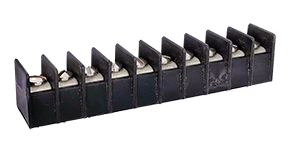 General Electric single row barrier terminal strip. 10 position. 2 sides labeled. 4-3/8" long x 7/8" wide. 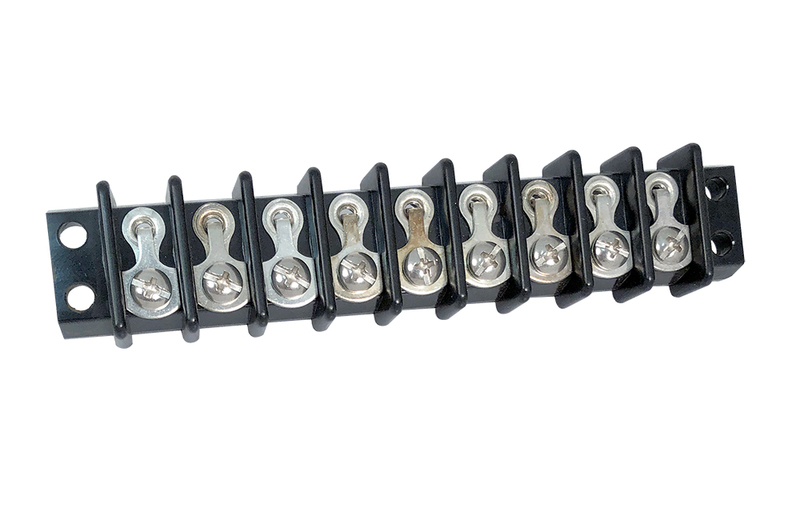 Weco single row, PC mount, right angle terminal strip. 10 position. Double spaced - every other position. 0.40" pitch. 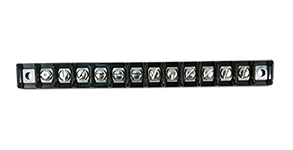 3.78"L x 0.349" x 0.508". Cinch double row barrier feedthru. 10 position. 15 amp. 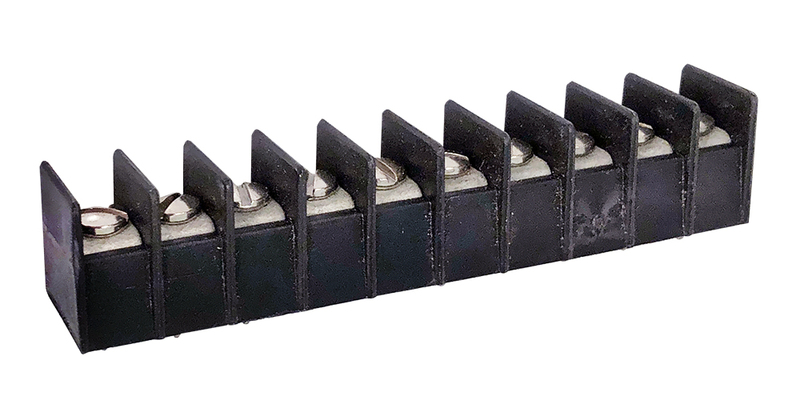 4.43"W x 0.875"W x 0.42"H.
Cooper Bussman Magnum A3, 10 position, single row barrier terminal strip. 30 amp, 600v, PC mount, 7/16" pitch. 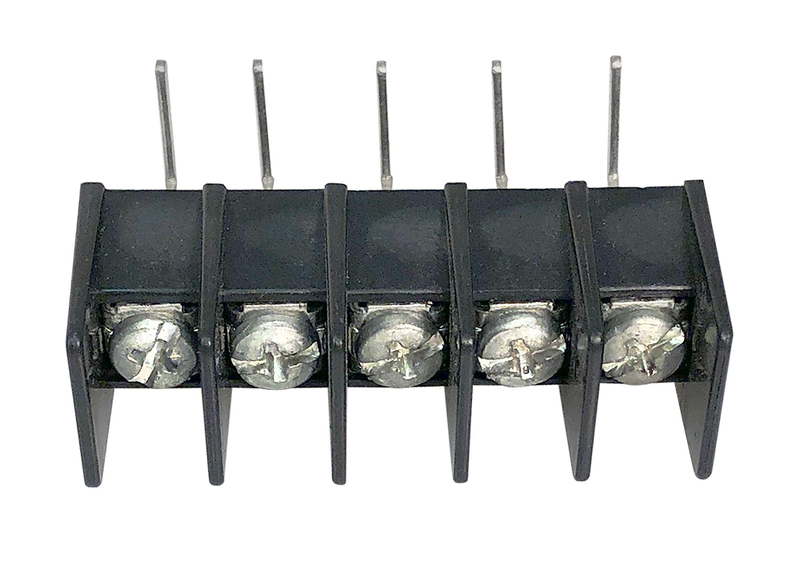 4-1/2"L x 5/8"W x 3/4"H.
Kukla single row barrier terminal strip. 11 position with removable feedthru terminal pin. 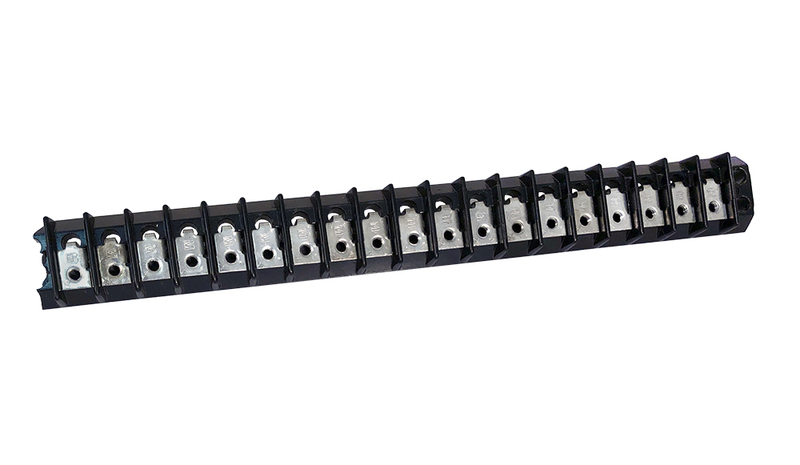 Molex Beau Series 69 Tri-Barrier 12 position terminal strip. 20 amp, 300v, PC mount. 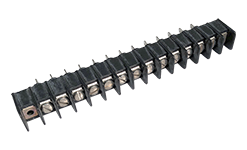 3-15/16"L x 9/16"W x 1/2"H.
Molex Beau Series 69 Tri-Barrier terminal strip same as above except 4 position. 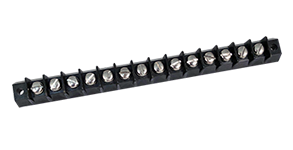 1-3/8"L.
Kulka feedthru terminal strip. 12 position. 30 amp. Navy. 1-1/16" x 8-1/2" x 1-3/8"H. 8" mounting centers. Includes nuts. NSN: 5940-00-518-9610. 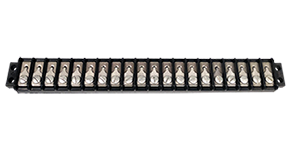 12 position, barrier feed-thru terminal strip. Cinch. 20 amp. Removable lug. 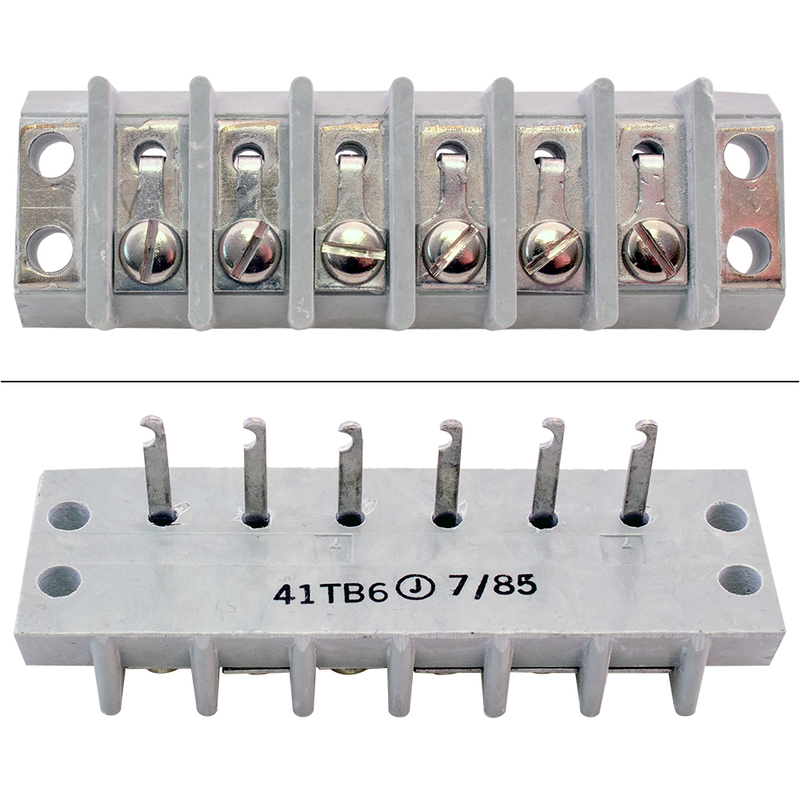 Pass-thru hole is threaded to create a standard 2 row barrier terminal strip. 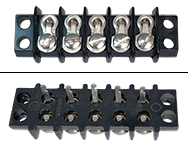 5-3/16"L x 7/8"W.
Single row, 12 position feedthru barrier terminal strip with back splash. 20 amp. 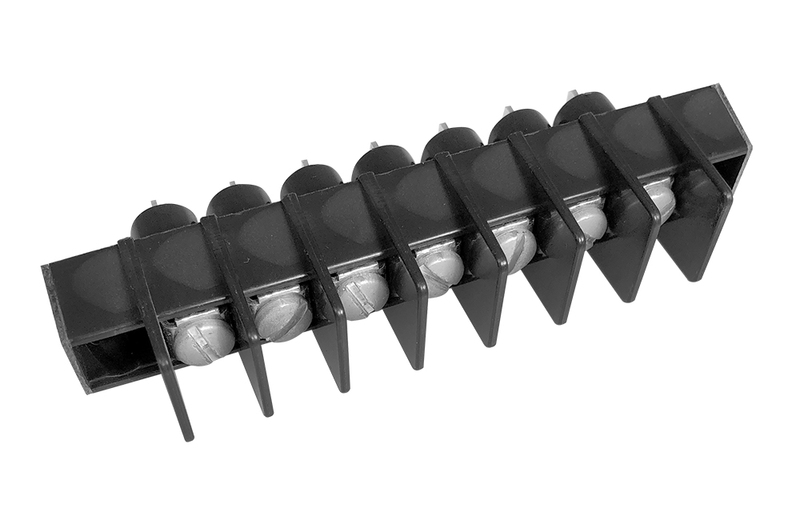 12 barrier positions with screw terminals. 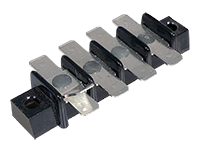 6" x 3/4" x 5/8"H. 5-5/8" c-c mounting holes. Kulka barrier terminal block. 12 position. 20 amp, 300v. Terminal block 2699. 6-3/16"L x 5/8"W x 1/2"H. 5-11/16" mounting centers. Kulka barrier terminal strip. 13 position. 20 amp. Shrouded terminals. 3/16" QC spades. 5-5/8"L. 5-1/4" mounting centers. 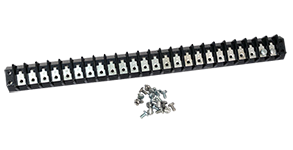 Cooper Bussman terminal strip combo - barrier terminal strip and cover strip. 14 position, 20 amp, 300v, shrouded, wire tie terminal. 1-15/16"L (1-1/2" center mounting holes). Terminal strip P/N: A20130307CA. 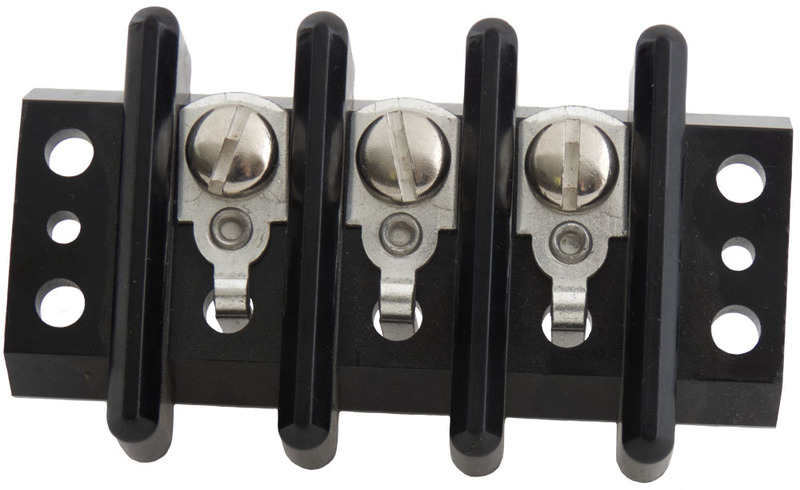 Beau single row barrier terminal block. 14 position. 10 amp. 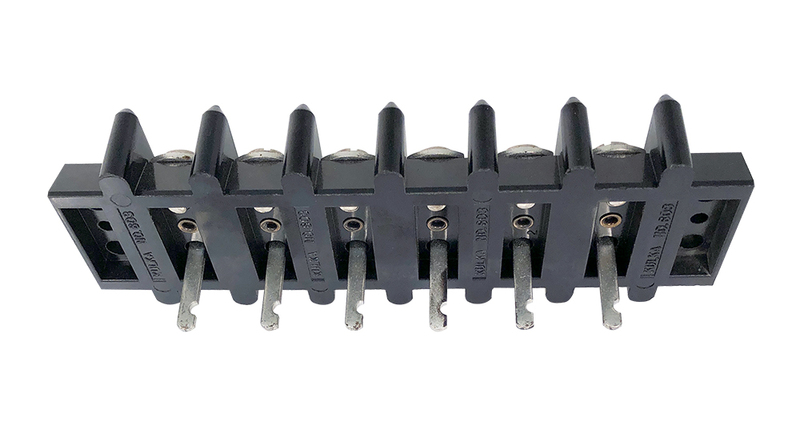 5-7/8"L x 0.567"W x 0.447"H.
Kulka barrier terminal strip. 14 position, feed-thru, 20 amp. 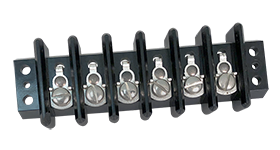 Feed-thru terminal can be removed revealing opposing threaded hole to create a standard barrier terminal strip. 6-7/8" x 1-1/8" x 1/2". 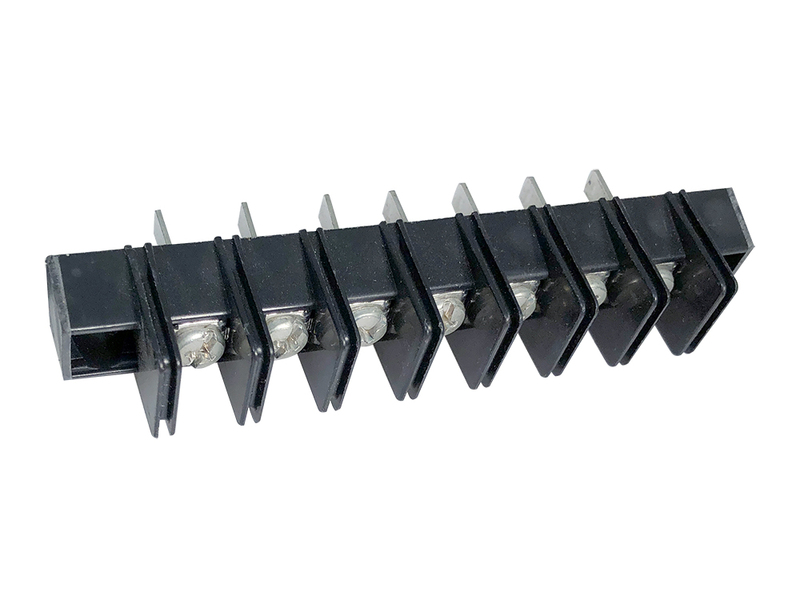 Magnum single row barrier feedthru terminal strip. PC mount. 14 position. 20 amp. 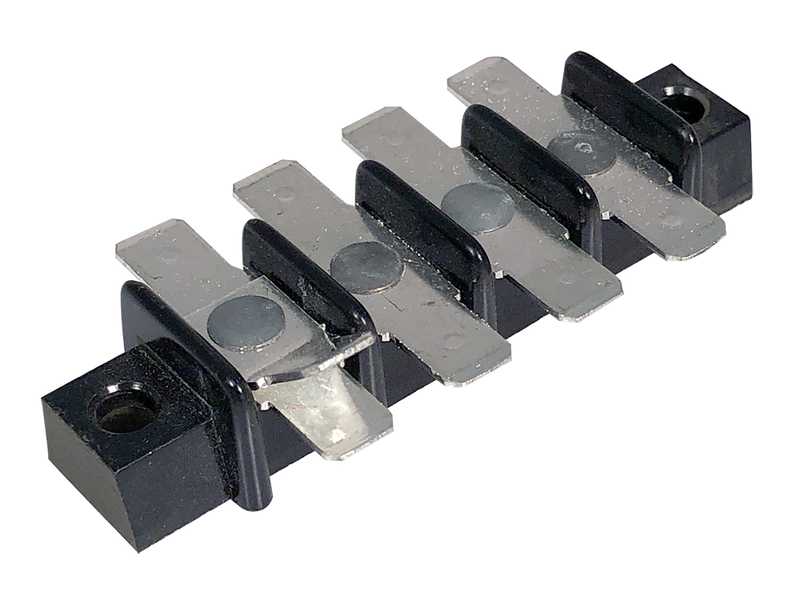 5-1/4"L x 5/8" x 3/4"H.
Curtis 15 position terminal strip, single row barrier with feedthru. Brass hardware. 0.2" pin length. 6-1/4" long x 0.685" wide x 0.560" high. Made in the 1970's. TE Connectivity barrier terminal strip. 6 Series. 16 position, 25 amp, 300v. 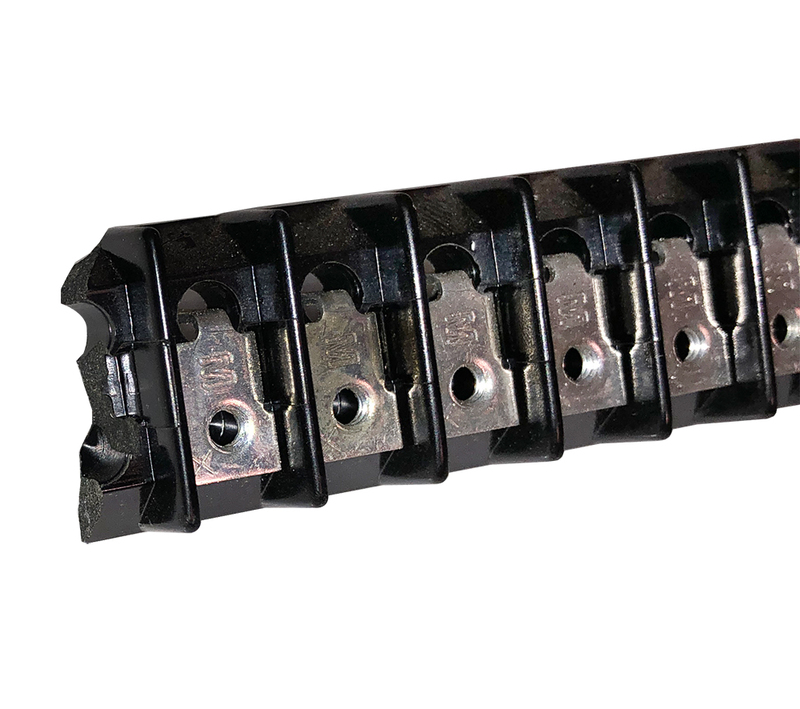 12 - 22 AWG. Turret terminals. 6-3/4"L. 6-3/8" mounting centers. Kulka barrier terminal strip. 16 position. 20 amp. Shrouded terminals, 3/16" QC spades. 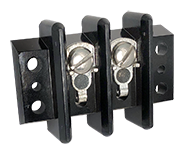 6-3/4"L. 6-5/16" mounting centers. Kulka feedthru barrier terminal strip. 16 position. 30 amp. 150ºC. 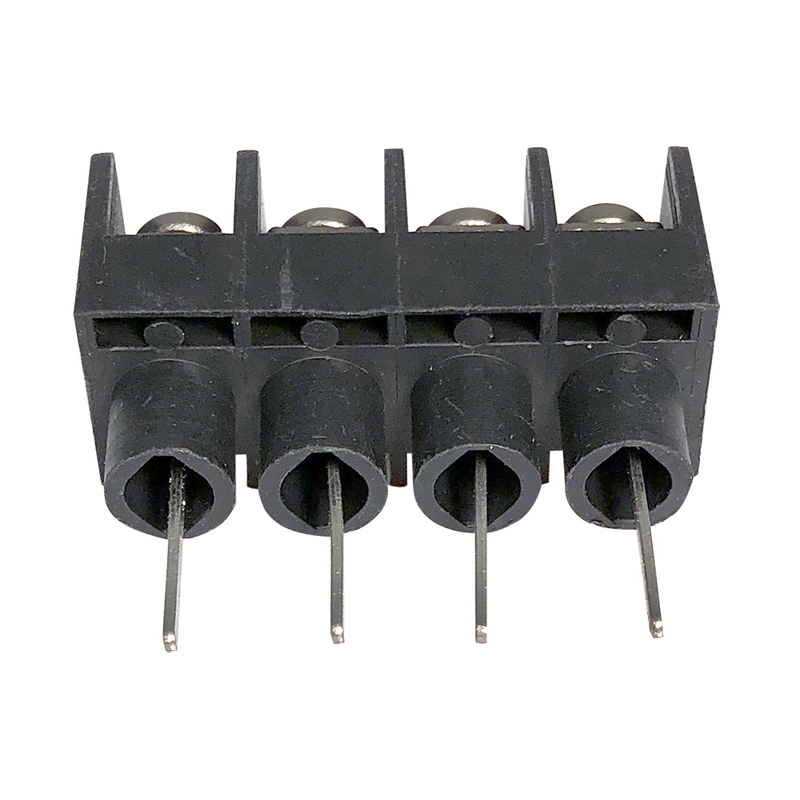 9.97" x 1.31" x 0.71"H. 9.56" x 0.50" mounting centers. Made in 1977. 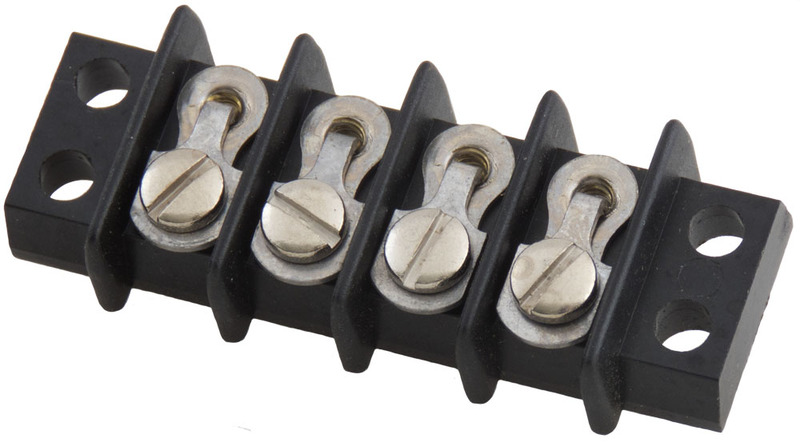 Eby single row tri-barrier terminal strip with solid back cover. 16 position, 20 amp, 300v, PC mount. 5-1/4"L x 5/8"W x 1/2"H. Straight pins out bottom for PC mounting. 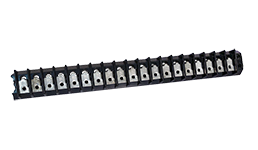 Eby single row tri-barrier terminal strip with solid back cover same as above except 22 position. 7-1/4"L. Straight pins out bottom for PC mounting. 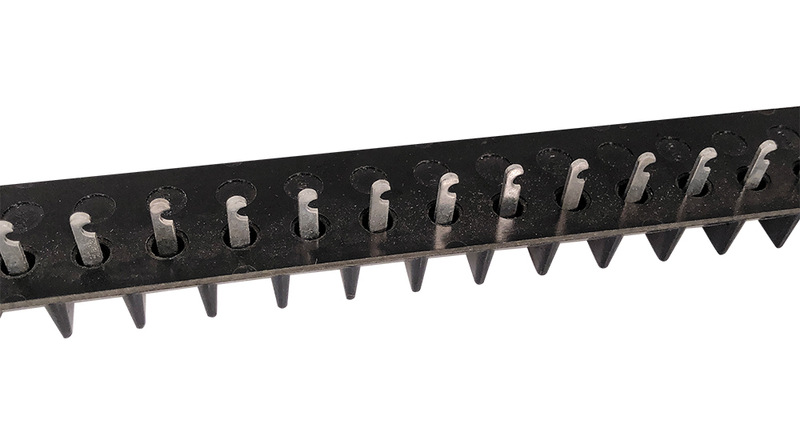 Kulka 16 position barrier feedthru terminal strip. 600v RMS, 10 amp, 3400v RMS test. 7.8"L x 1-1/8". 7.5" mounting centers. NSN: 5940-00-983-6137. Jones 17 position, barrier feed-thru terminal strip. 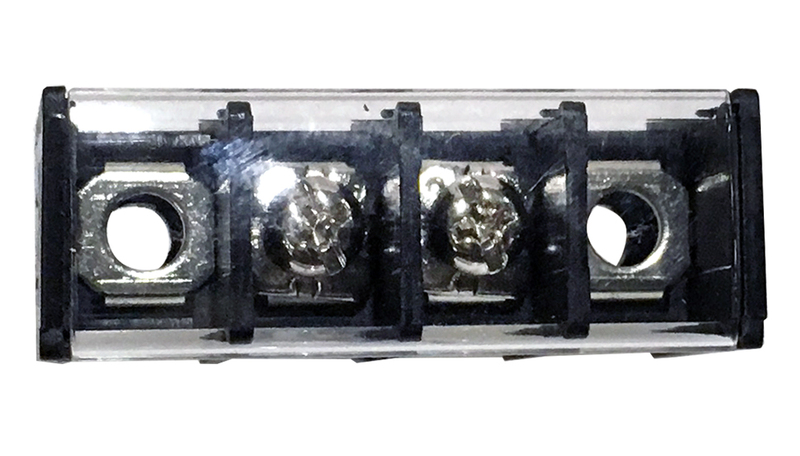 1-1/8" x 8-1/4" x 1/2"H.
General Electric 18 position feedthru barrier terminal strip. Positions labeled 2 sides. 20 amp. 7/8" wide, 7-3/8" long. Harris P/N: 614-0676-00. Kukla 18 position barrier feedthru terminal strip. 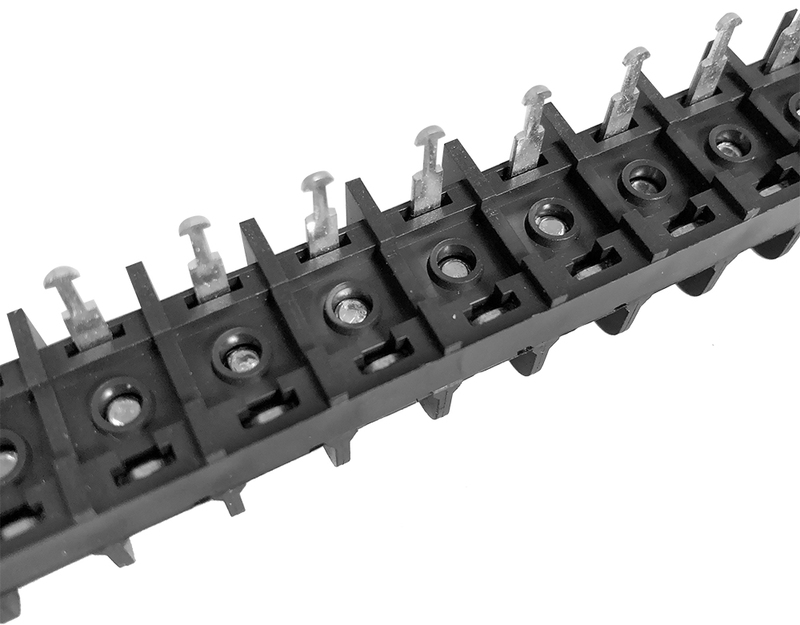 18 position single row barrier terminal strip. 5/8" x 7-1/2" x 7/16"H. 7-1/4" c-c mounting holes. PC mount, individual feedthru 0.095"D x 0.119". Feedthru barrier terminal strip. 19 position. 10 amp. Screws NOT included. NOTE: Broken mount on one end. 7 -5/8"L.
Feedthru barrier terminal strip. 20 position. 30 amp. 9-1/2"L x 1-1/8"W. 0.450" screw centers. 8-32 screws. 9-1/8" mounting centers. 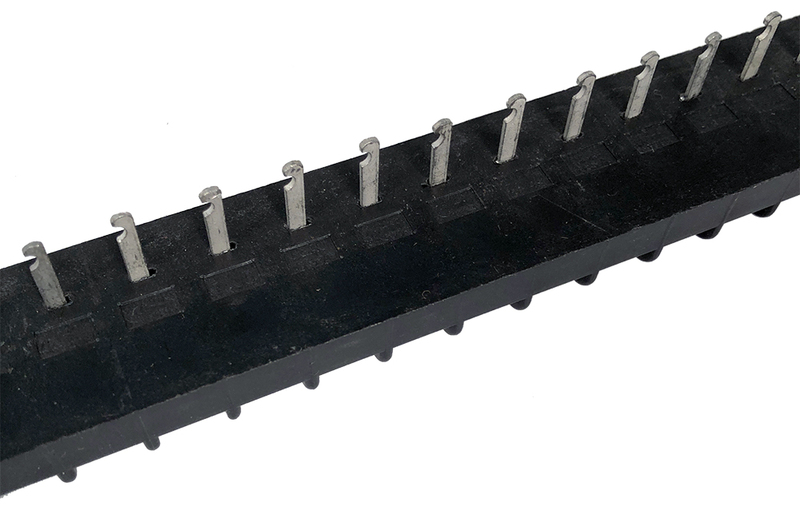 Wieland PCB terminal block. 20 numbered positions. Vertical mount (F/T). 250v, 10 amp. 0.20" pitch. 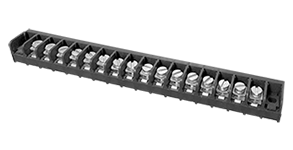 4"L x 0.314" x 0.455"H.
Curtis 20 position terminal strip, single row barrier with feedthru. Turret terminal. 0.5 amp. Brass retainer shoe each position. 5/8" wide, 7-1/2" long with ears, 1/2" high. 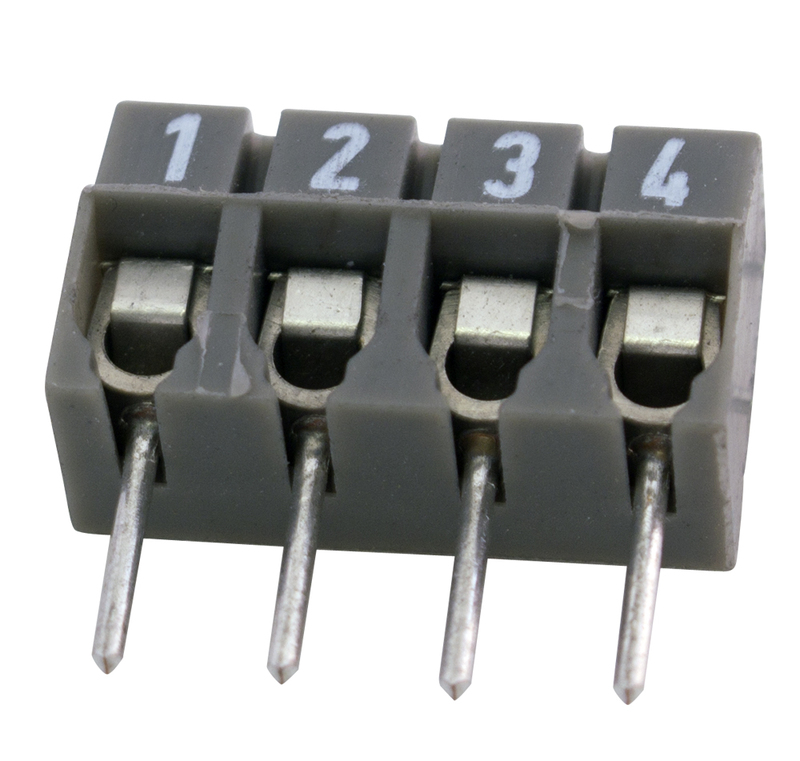 Wieland PCB terminal block. 24 numbered positions. Right angle. 300v, 10 amp. 0.174" pitch. Vertical PC mount. Screw/spring connector. 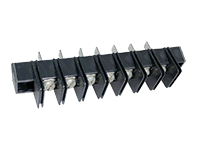 4.7"L x 1/2"W x 1/2"H.
Feedthru barrier terminal strip. 24 position. 40 amp. 14-1/2"L x 1-1/4"W. 0.575" screw centers. 10-32 screws. 24 terminal. Single row barrier terminal strip is flush for pc mounting. No ear holes. Vernitron, green. 10-5/8" x 3/4" wide x 9/16" high. Straight pins out bottom for PC mounting. 24 terminal. Single row barrier terminal strip is flush for pc mounting. No ear holes. Kulka, green. 10-1/2" x 3/4" wide x 3/4" high. Feedthru barrier terminal strip. 30 position. 20 amp. Barrier 3/8". 12" x 0.881" x 0.454" high. Feedthru barrier terminal strip. 30 position. 30 amp. 13-7/8"L x 1-1/8"W. 0.450" screw centers. 8-32 screws. Feedthru barrier terminal strip. 36 position. 20 amp. 14-1/4"L x 7/8"W. 0.378" screw centers. 6-32 screws.